Confectiona’s Realm » Blog Archive » I Made One Up! « Just Like Friday, but on Saturday! I finally have a recipe to offer here, one that’s all my own. This is so exciting. Chop the tomatoes and green beans however you like them; keep them in separate bowls. Heat the olive oil in a large frying pan over high heat and add the tomatoes, stirring occasionally. They’ll get really watery, and then the water will cook off, leaving you with a lovely sauce. At some point while they’re still watery, add the wine; when they’re closer to done, add the garlic powder and salt. The whole process took me about 10 minutes, but it will vary depending on how high your flame is and how watery your tomatoes are. Meanwhile, brown the ground meat in a large frying pan or wok; I used a wok because I tend to slop food over the side when I try to stir-fry in a frying pan. When it’s done, remove it (leaving the fat behind) and set aside. Add the green beans to the fat in the pan or wok and stir-fry till they’re as tender as you like. It helps near the end to turn the flame down and cover the pan to let them steam a bit. When they’re done, throw the meat back in to warm up. Meanwhile (yes, there are a lot of steps, but it’s worth it! ), cook the pasta in boiling salted water till done. Drain. Mix everything in a big bowl, then mix in the basil. Serve immediately, with parmesan if desired. This was really good. Son #1, who tends to disdain anything with tomatoes and/or most green vegetables, took seconds. Son #2, who in fairness likes almost everything (he’s a very happy child), said it was very good. 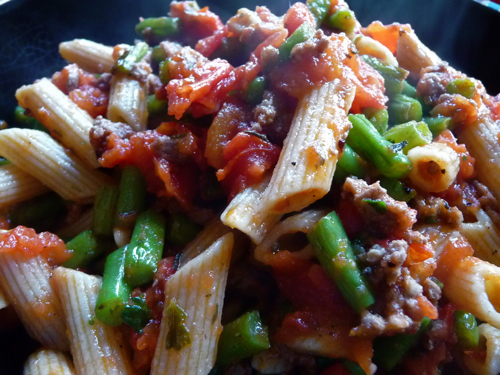 Husband liked it quite a bit; he said the proportions of everything were excellent, and the snappiness of the green beans were a nice contrast to the pasta and tomatoes. I will definitely do this again — I got two different kinds of vegetables in there! This entry was posted Sunday, August 17th, 2008 at 9:45 pm	and is filed under food, recipes. You can leave a response, or trackback from your own site.